I was walking on the trail yesterday, when something leaping through the woods startled me. That something was this small fawn! She was prancing joyfully with no care in the world. Her mother was standing nearby watching me watching her baby. Intently watching me. I couldn’t help but wonder if this tiny, beautiful, perfectly-spotted being was the result of the act of creation that I witnessed in this exact space several months ago. I would like to think so. I cannot be sure, of course. I am nearer to God in these woods than I have ever been elsewhere. Muir writes about Nature being a cathedral and teaching us all we need to know about worshipping. I turn to Mary Oliver to express exactly how I feel about the sacred. I go to the woods and there I meet my brothers and sisters in giving praise. His small hooves struck the grass. Walked to my hands, to my knees. I did not touch him. Photos taken by me, North Carolina July 2017. Beautiful, Cheryl! Thank you for sharing this witnessing of Nature as holy, heart-inspiring cathedral. You’re welcome. It was quite an experience. Nature inspires me daily. That should be ‘with’ not just ‘wit’ 🙂 I need a new keyboard!! Thanks, Pauline. 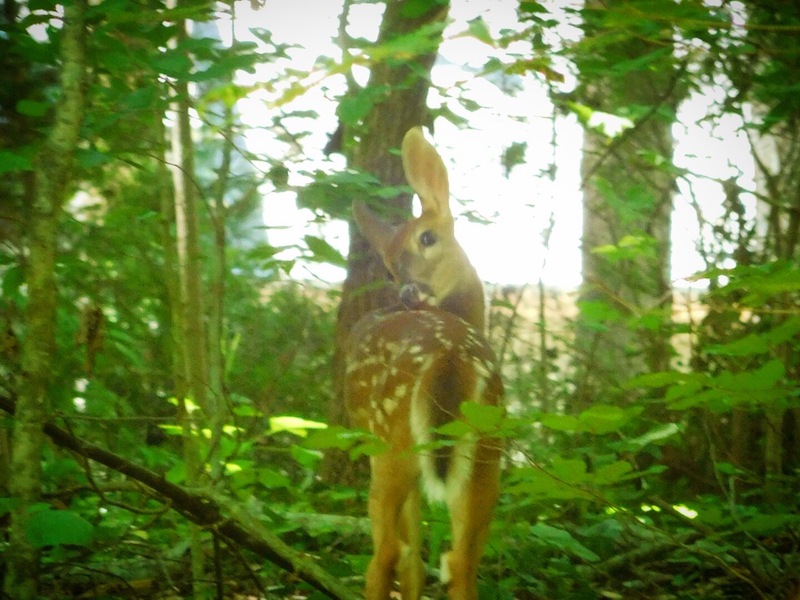 The way the fawn looked at me so innocent, so trusting gave me great pause. I feel so much compassion and love for wildlife. And concern. Beautiful. I feel connected with nature as well at my lake house. I just drove here today and saw several deer walking serenely down a path near my driveway. They’re so much fun, and peaceful, to watch. Enjoy your time away! Absolutely lovely. We appear to be drawn and moved by many of the same things. Nature is glorious and my place of spiritual worship as well. Thank you for sharing. Yes, I think so:) Thank you. Ah! Yes to the woods, to the doe, to the act of creation, to the fawn, to the singing!! Yes! & thank you for posting these most beautiful words and experiences. This season, early spring, a doe from out herd decided to fawn two in our backyard. We moved them out to the field next door shortly after their birth. To hold a newborn fawn: that is holy! Yes, what a holy moment. Such encounters! What a perfect marriage of words to pictures, and posted on the day my husband and I celebrated our 30th wedding anniversary. Wish I would have stumbled upon this then, but doing so now is good, too.